NEW FURNACE & AIR CONDITIONER 2018! Spacious, Custom Built Home with 1st Floor Master Suite! Located 1 Block from the Fox River on 1.18 Acre Lot! Master Bath Includes Separate Shower, Jacuzzi Tub and Dual Sink Vanity! Three Additional Large Bedrooms PLUS Den on 2nd Floor, Along with "Bonus Room" Over Garage! Second Floor Bath Features Dual Sink Vanity and Private Shower/Bath and Toilet Area! Open Floor Plan Kitchen and 2-Story Great Room, Perfect for Entertaining Family and Friends! Dream Kitchen w/Abundance of Maple Cabinetry, Island w/Breakfast Bar, Gas Cook Top and Built-In Oven! Energy Efficient 2x6 Construction! 9' Deep Pour Basement is Plumbed for Additional Full Bath. . . Huge Back Yard Just Waiting for Your Pool, Pole Barn or Mini-Golf Course! Imagine No Water and Sewer Bills! Country Living at Its Finest! 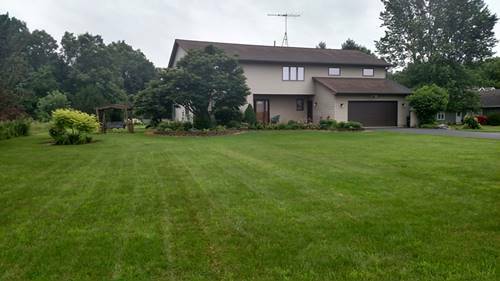 For more information about 8 Shagbark, Newark, IL 60541 contact Urban Real Estate.